There are times in your life when you need a lot of caramels. Weddings, commitment ceremonies, baby showers, birthdays, Thursdays—whenever. We offer quantity discounts to celebrate those events in style without foregoing your ethics. 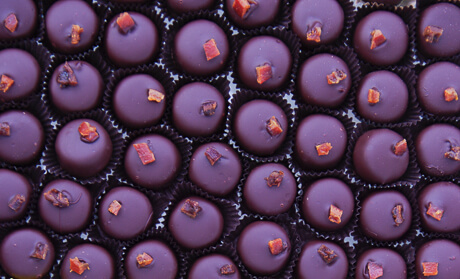 We’re known for our decadent, melt-in-your mouth caramels made with fresh spices, local herbs and fruits and enrobed in pure semisweet chocolate. Caramels are an excellent choice for weddings or other celebrations because they have a longer shelf-life than truffles or ganache bonbons (2 months!) and hold up better under warm conditions. Loose caramels arrive clad in candy cups and packaged in boxes of 35, so that you can package them yourself to use as favors or to arrange as you like at your event. The minimum order is 105 caramels. Please ensure a lead time of at one week (2 weeks if it’s a busy holiday season) to fulfill all bulk orders, as much time as possible is even better. We do everything small-batch to ensure it’s as fresh as it can possibly be, which means we need enough time to make sure we can produce your chocolates in the quantity you want!